Natural can still add to your waistline! possible. Almost always clients are really successful in transforming their bodies, losing body fat, gaining lean muscle, looking healthy and fit. Sometimes though it does not work. Even though they are eating as we suggested (or so I think) our clients transformation seems to stagnate or slow down. When this happens we recommend our clients to write down what they eat by using a site/app like MyFoodDiary. It is an easy way to find out what our clients exactly eat and it is simple to use. Honey: Even though honey is a natural product and in its raw form can have healthy qualities, it still is primarily sugar. Excessive amounts of honey definitely can add to your waistline and mess with your blood sugar if you are pre-diabetic or diabetic. Keep the total amount of honey to 1-2 Tbsp per day at the most when trying to lose weight or body fat. Dried Fruit: Fruit is fruit, right? Nope, dried fruit has a higher density of carbohydrates, lower number of phytonutrients and can have lead to the same problems as honey. When losing weight we recommend to stay away from dried fruit. 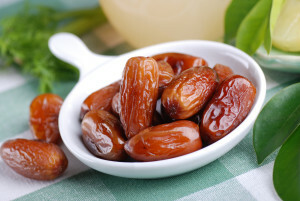 We had a client who ate 3 lbs of dates in a week and he was wondering why he was not losing any weight. After getting him off his dried fruit diet, the weight came off as well. Organic Agave Syrup. It is 2-3 times as sweet as regular table sugar. Therefore a smaller amount would be needed. In the end WebMD recommends the use of honey if sweetener is necessary because it has marginally more health benefits. Fatty Meats: I don’t particularly have a problem with you eating fatty meats, since cholesterol in your food does rarely impact serum cholesterol in your blood. In addition the whole cholesterol debate is rather controversial by now anyway. The problem you are going to run in though is, extremely fatty meats will contribute to your overall caloric intake. Even though some representatives of the overall pretty healthy paleo diet claim that you can eat as much as you want, it is simply not true. If you are an chair-warrior who moves very little you can overeat. Just because you eat a healthy, whole foods diet, does not mean that you can go out and eat as much as you want…I mean, you can but your waist will have a tendency to expand. Eat 1 cupped handful of carbohydrates (2 if a man) directly after working out.